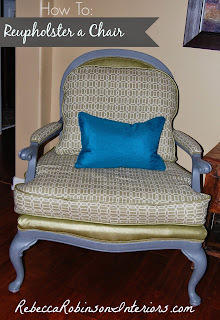 Rebecca Robinson Interiors: Command some order! We all have busy lives. 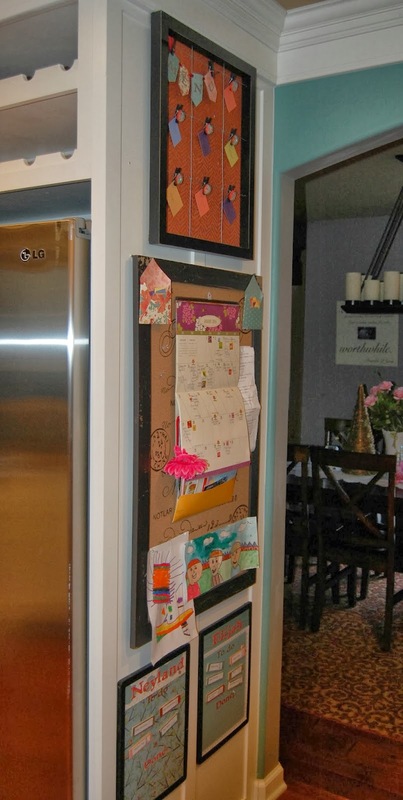 If you have little ones at home, you have even more to organize between school, sports, and other family activities. One thing that I have recently adopted was a new command center. everyone will see throughout the day. 2. Have a calendar with events for the month. Some people like dry erase boards. I like a nice pocket calendar that comes with stickers. I suppose that is the kid side of me. I keep a flower pen tucked in the pocket for easy access. There is always room on this bulletin board for a running grocery list, tickets to a show or concert, library lists, and of course my kids art of the week! 3. 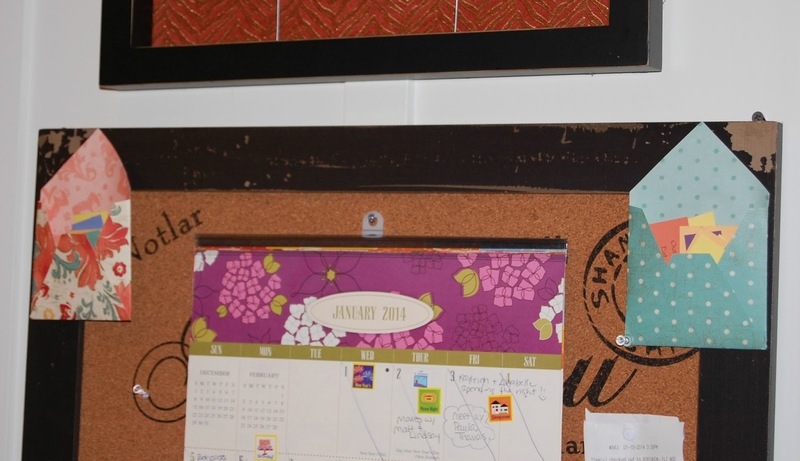 A menu board helps you to plan your weekly meals. I sat down and wrote out our family favorites. I kept the food types by color ( crockpot -purple, Italian - red, asian- orange, etc.) On the back of each card is a quick list of ingredients to make writing out my grocery list easy. I made two pockets to rotate the meals. The pocket on the right is meals we recently have had. I look through the pocket on the left first and then go to the right. This is my effort to not have too many repeats. All though pizza night does comes through the rotation more often than others! 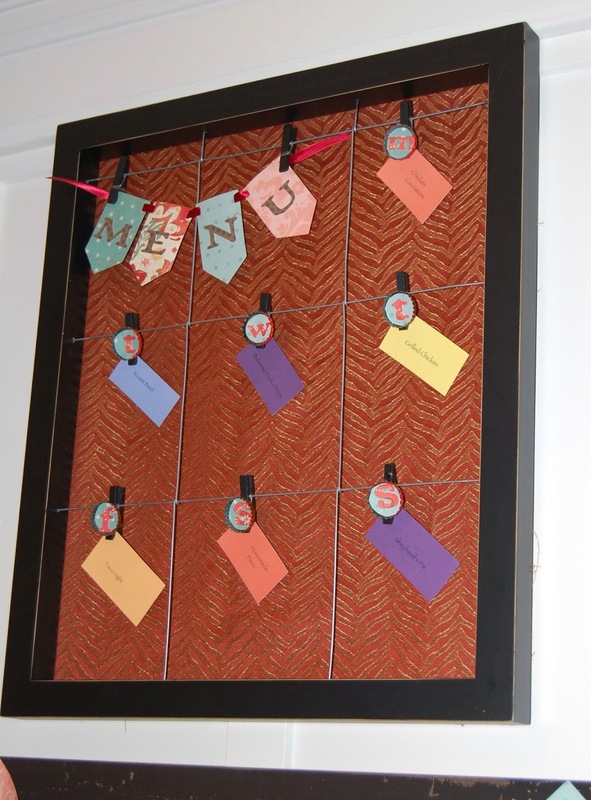 Menu boards can be made out of anything! 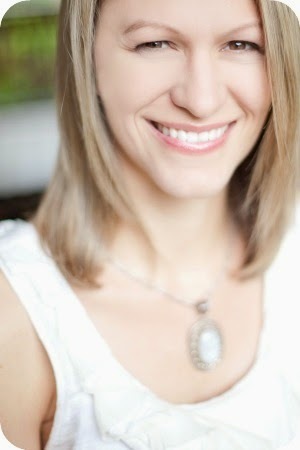 This one was a black frame from Pier 1. It had the wire and clips already on it. I just added a small fabric remnant to the back for some depth. The days of the week are bottle caps glued to the clothespins. 4. 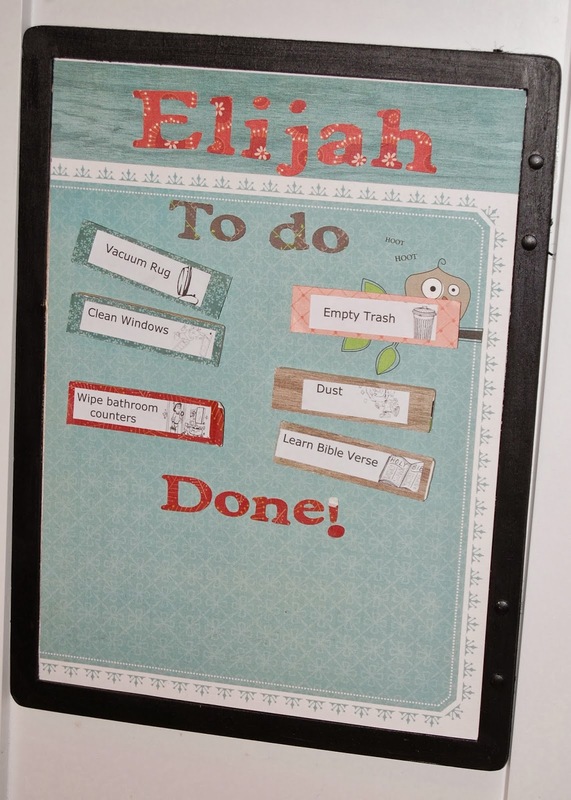 Chore charts are a must! I have had the 'Melissa and Doug' responsibility charts, but they are too vague for us. So, in efforts to repurpose, I painted the frames black to go with my other boards. I used scrapbook paper and my Cricut to cut my kids names,etc. 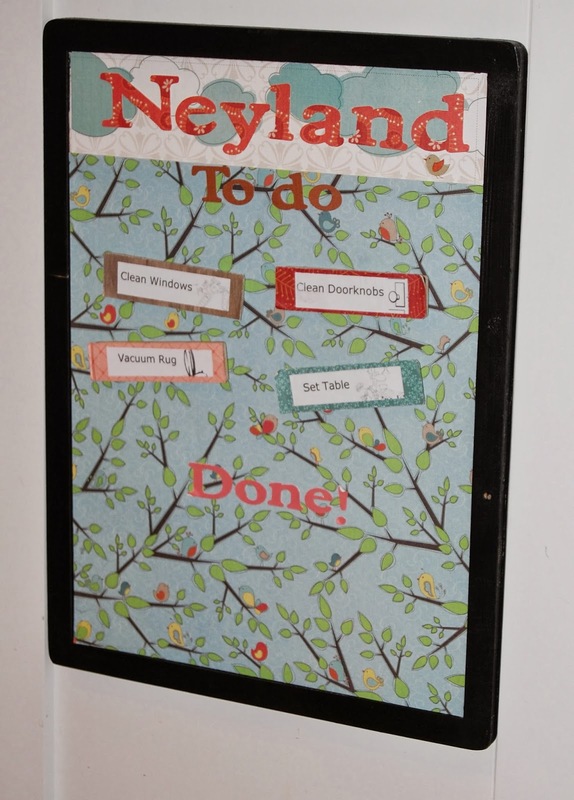 The magnets are recycled from the original charts but with customized chore stickers that I made. At the beginning of the week the chores are at the top. As they complete them, they can move them down under the Done! Chores will change with time, age and maturity. My chore stickers have pictures on them so my four year old can see what he needs to get done. Here is a great website with ideas for age appropriate chore ideas. 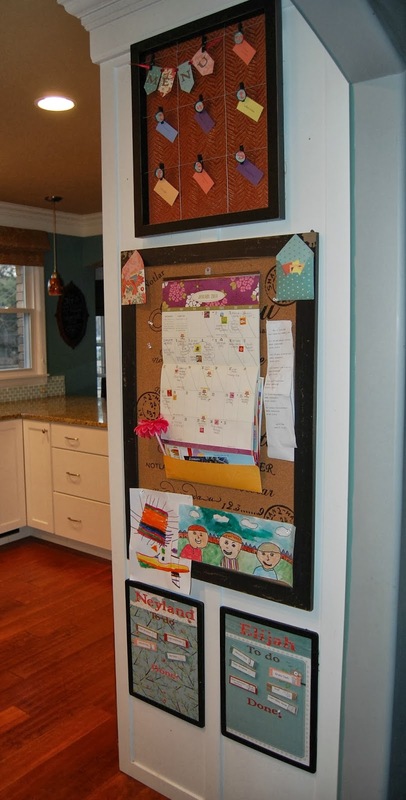 Having a command center is a great way to keep your family organized and focused. I hope this has inspired you to design your own center. Look around your house and try to reuse materials you already have.